Native & Search enables you to target specific audiences based on Oath’s rich inventory of data partners. That means, you can use third-party data providers relevant to your campaign objectives to expand audience reach and improve performance. 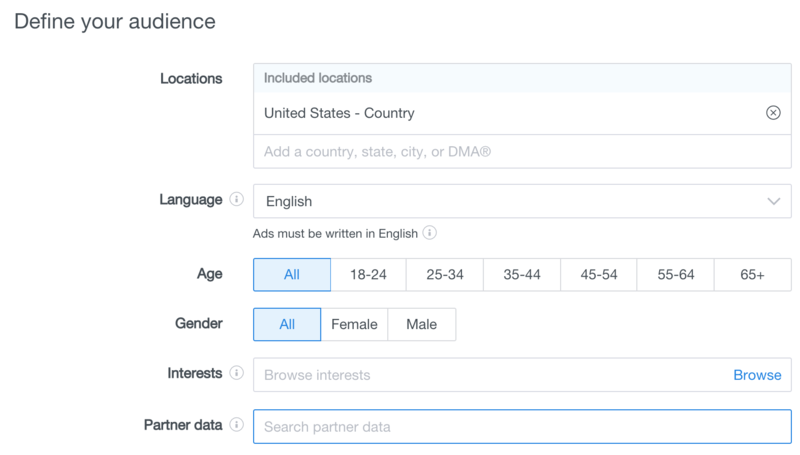 Using this new targeting capability, you can view reports for audience segments that include third-party data in the Native & Search UI and evaluate that data when serving ads to particular audiences. Third-party data can help you run more efficient and cost-effective campaigns, and target the customers who are most likely to meet your campaign goals. Navigate to the Define your audience panel for your advertising campaign. In the Partner data search field, enter the third-party partner data that may be relevant to your campaign objective for targeting purposes. For example, if you enter Car Owner in the Partner data field, the results of your query are returned with a list based on third-party data, specifying audience details, like audience size. You can also scroll down the list for additional information on audience size for those car owners. Now you can enter another search item – for example, Dog Food Purchasers in the Partner data field above. The audience segment is then further defined for more specific targeting of your ads.